By the mid-19th century, knitted fabrics had all but replaced the traditional woven linen and cotton used for men's drawers. 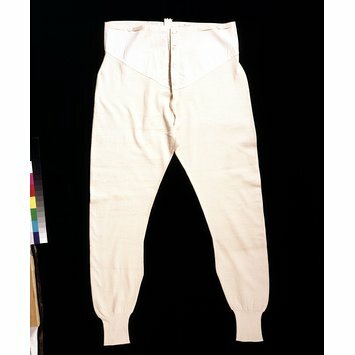 The more closely fitting pantaloons and trousers that became fashionable in the early 19th century required underwear that fit snugly. 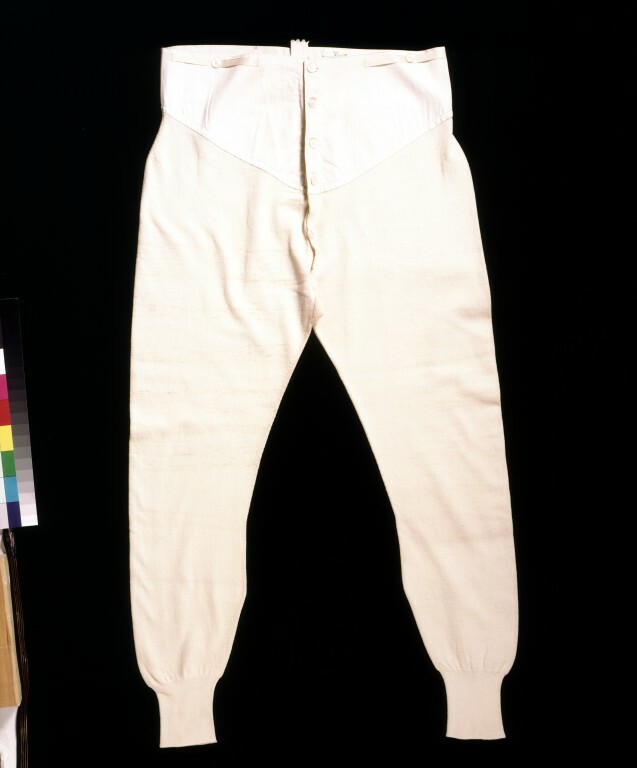 The traditional philosophy that underwear was to protect the outer clothing from contact with the skin was still current and full-legged drawers were standard for men until the turn of the century. Still in use was the 18th-century method of fitting the drawers to the individual by use of the eyelets and ribbon-laced insert at the back. The major innovation here is the use of a knitting machine or power-operated knitting frame. Until the mid-19th century, knitted garments were made by hand or on a knitting frame, which required one operator per frame. The application of steam and eventually electrical power allowed many machines or frames to be operated at once. Knitwear was a booming British industry and an important representation at the Great Exhibition in 1851. In all media, one of the great strengths of the Exhibition was its liberal attitude to both machine and handmade objects. Each method had its advantages and beauties. The Juries reporting on the Exhibition considered machine knitting particularly significant. They were aware of its economic importance and very concerned that Britain keep pace with technological advancement. Underpants for a man of machine-knitted natural wool. Fully fashioned. The waistband is of white linen and machine-stitched with a lace-up adjustment at the centre back and a fly front fastening with pearl buttons. There are button ribbon loops on either side of the front for braces. The pants are shaped to the leg and reach to the ankle where there is a knitted welt.